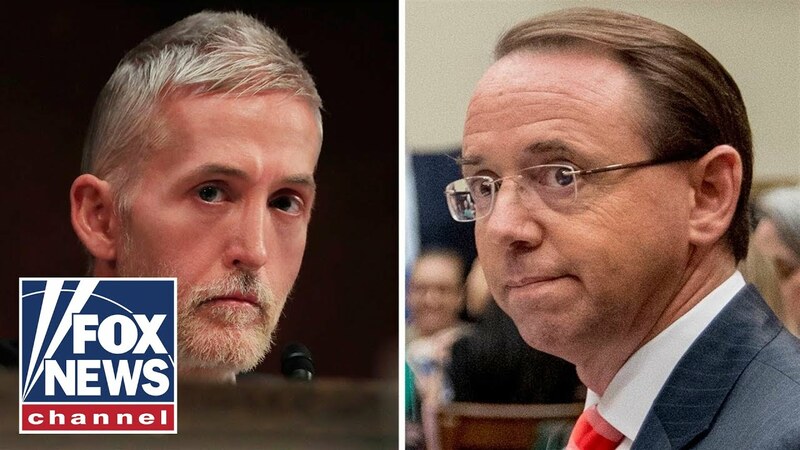 It’s quite revealing and speaks volumes that Rod Rosenstein continued to look down refusing to make eye contact with Trey Gowdy at the very moment he was being called out for his unscrupulous biases. FBI Director Wray and DAG Rosenstein are on Capitol Hill Thursday publicly testifying to House Republicans over the FBI and DOJ’s mishandling of Hillary’s email investigation and Spygate. On Thursday, House Republicans held a vote and passed a resolution demanding the DOJ comply with requests to turn over classified Trump-Russia docs or face impeachment, contempt. Rep. Trey Gowdy (R-SC) torched Rosenstein on Thursday and told him to show evidence of Trump-Russia collusion or shut the investigation down because it is ripping the nation apart. Gowdy said Russia is not being hurt by the investigation, rather the US is being torn apart. “Whatever you got, finish it the hell up,” Gowdy told Rosenstein. Of course, we know Rosenstein and Mueller’s plan is to drop an ‘October surprise’ by releasing a report right before the midterm elections as a way to meddle and prevent Republicans from picking up more seats. Rosenstein’s smug attitude during Thursday’s Congressional hearing was completely unacceptable. The Deputy Attorney General laughed at GOP lawmakers and refused to answer questions by House Republicans. Rep. Jim Jordan and Rosenstein had a fiery exchange during the hearing. Jordan reminded the Deputy Attorney General he has “seven days to get his act together” after the House voted on a resolution to compel the DOJ to comply with document requests or face impeachment. Even more egregious, the corrupt DAG Rosenstein then vowed to ‘clean up the Justice Department’ whilst defending the Russia probe.